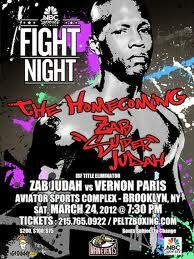 Zab Judah takes on Vernon Paris this saturday, who do you think will win? Main events won the purse bid for an IBF title eliminator between Zab Judah and Vernon Paris, with the fight airing tonight. It’s an old guard vs new kid-type match-up, with Judah looking to prove he still has something left and Paris wanting to show us he is the real deal. It’s a great fight, one I’ve already made my pick for and will be happy to share with you. First I need to beat up on Zab Judah for a while. I’m not a fan of the guy; he’s obnoxious, arrogant and makes threats he can’t always keep. I remember years ago when he told us that he needed to act like a father and give Miguel Cotto a spanking. We all know what happened there, although Zab has probably forgotten. He’s a guy a lot of fans hate. Not love to hate, just hate. I don’t hate him, but I dislike his antics and unlike Mayorga, I don’t think he does it to sell fights. As a fighter, I have a bit more respect for him. There was a Zab Judah once who was at the top of his division and could give anyone a good fight, but that was years ago, way before he was shocked by Carlos Baldomir. Lately the Zab Judah pattern is win-win-win, big loss, win-win-win, big loss, repeat. His wins come over decent-but-not-world-class fighters and get him into title shot contention, only for him to crumble when he faces someone with skills. Amir Khan gave him a boxing lesson back in July and we haven’t seen Zab since. Losing to Khan and staying inactive for six months seems to be all you need to do to get a title shot these days because, coming back on topic, Zab Judah and Vernon Paris will be fighting for the chance to face IBF champion Lamont Peterson. That’s assuming Peterson is still the champion by then, but that’s something I don’t want to get into right now. I don’t know about you, but I like Zab Judah for this fight. Yes, that’s even with the kind words I have written about him above. He has too much speed and power for Paris, and this is a bad style match-up for the young prospect. Paris comes to us hotly touted and on a twenty-six fight unbeaten streak, but who has he really beaten? His last five opponents have seventy-seven collected losses and Paris had to go the distance with three of them. He lacks experience and isn’t a power puncher, and this is why I have to go against him. I know there are a lot of anti-Zab boxing fans out there, so I’d like to hear from you. Make Paris’ case for a win, because I just don’t see it. IF you need some help making up your mind, although really I urge you to make it up before you watch it, here is a video with some Zab Judah vs Vernon Paris analysis.